May hold, but of type commonly subject to surface motion. Found this control while bicycling around the old naval amphibious warfare training center. Mark is in good condition with the survey marker still in place as well. DESCRIBED BY COAST AND GEODETIC SURVEY 1944 (TBR) STATION IS ON THE NAVAL AMPHIBIOUS TRAINING BASE ON THE NE BANK OF BACK CREEK, ABOUT 1 MILE N OF THE TOWN OF SOLOMONS, S OF THE MACHINE SHOP FOR THE BASE WHICH IS THE E OF TWO LONG BUILDINGS, 27.48 METERS SE OF THE SW CORNER, AND 28.69 METERS SW OF THE SE CORNER OF THE MACHINE SHOP. THIS BUILDING IS ALSO USED FOR GYRO TESTING. 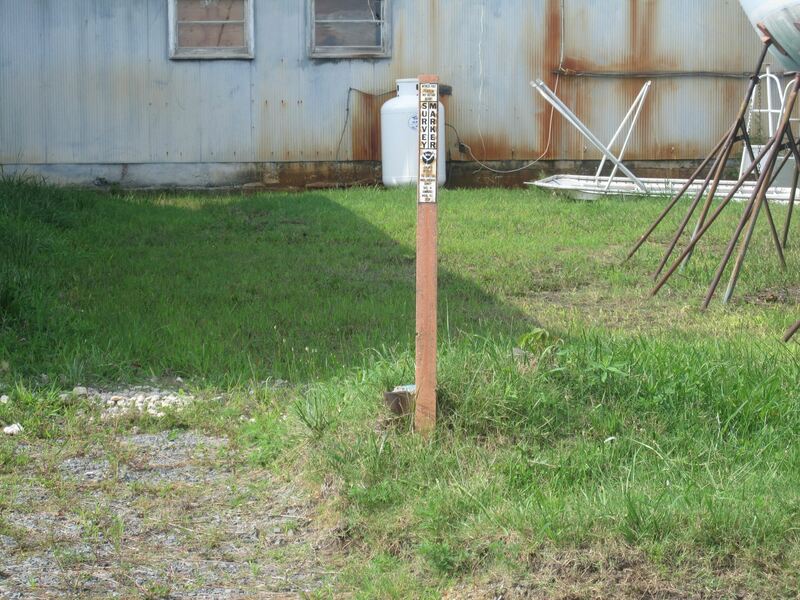 STATION MARK IS A BRONZE HYDROGRAPHIC-STATION DISK SET IN THE TOP OF A CONCRETE POST. IT IS FLUSH WITH THE GROUND AND PROTECTED BY A PIPE FRAMEWORK. RECOVERY NOTE BY COAST AND GEODETIC SURVEY 1960 (LFB) STATION RECOVERED IN GOOD CONDITION. A NEW DESCRIPTION FOLLOWS--STATION IS LOCATED ON THE NE BANK OF BACK CREEK, ABOUT 1 MILE N OF THE TOWN OF SOLOMONS ON PROPERTY OF CALVERT MARINA AND YACHT CLUB. 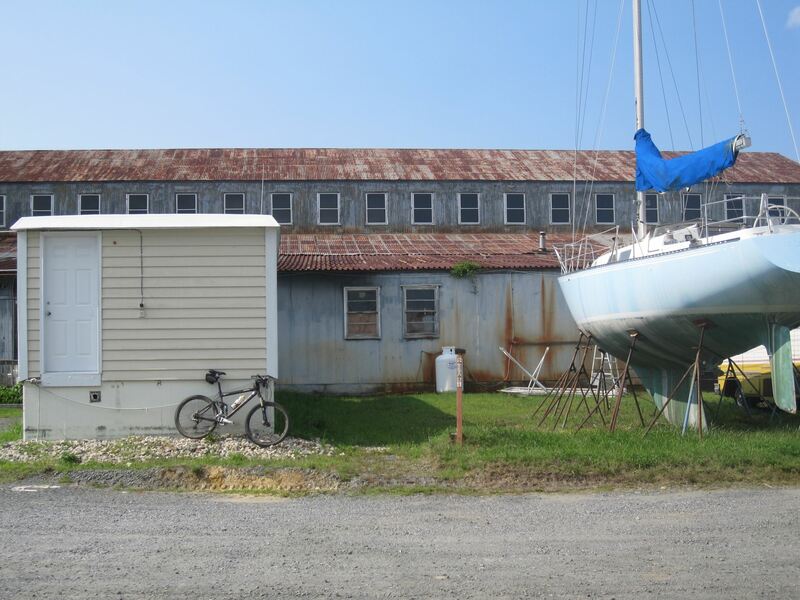 ON THE SOUTH SIDE OF THE MOST EASTERLY OF TWO LARGE BUILDINGS USED FOR BOAT STORAGE, 90.1 FT. SE OF THE SW CORNER, 94.0 FT. SW OF THE SE CORNER AND 2 FT. NW OF A SMALL ASH TREE. 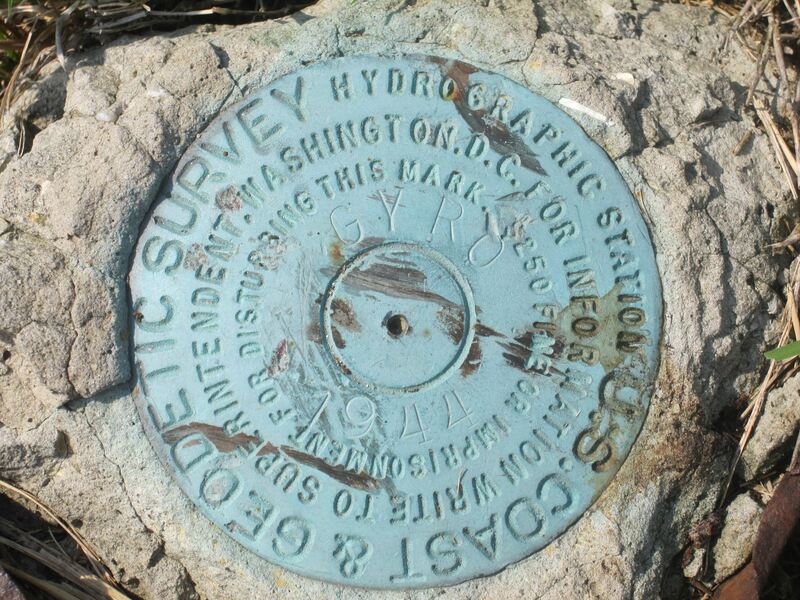 STATION IS MARKED BY A HYDROGRAPHIC-STATION DISK STAMPED GYRO 1944 SET IN TOP OF A CONCRETE POST PROJECTING 6 INCHES. RECOVERY NOTE BY US POWER SQUADRON 1989 (WSB) RECOVERED IN GOOD CONDITION. The horizontal coordinates were established by classical geodetic methods and adjusted by the National Geodetic Survey in January 1992. The orthometric height was scaled from a topographic map. The Laplace correction was computed from DEFLEC99 derived deflections.